A dinner jacket, of black wool, with satin effect collar, cuffs and button, lined with burgandy satin lining, labelled inside “N Berman Ltd, 18 Irving St, Leicester Sq, WC2” inscribed “Sean Connery”. “N Berman Ltd” is probably a mistake, since “M Berman Ltd” was the costumer at that address who worked on countless films made in Britain. Their name on the label was written in an ornate blackletter typeface, so the “M” could have been mistaken for an ornate “n”. Later they add, “The jacket has been altered after use in later productions.” This explains the silk gauntlet cuffs that weren’t in Thunderball and are a different shade of black that the lapels. But allegedly, the dinner jacket that Bonham’s sold is not the one that Sean Connery wore in Thunderball because the colours, cuts and shawl collar shapes of the jacket pictured at the auction and the jacket as seen in the film do not match up. The dinner jackets look very much alike and there is no suggestion of wrongdoing on Bonhams’ part. The colours of the dinner jacket as seen in Thunderball and the dinner jacket sold at Bonhams are different. In Thunderball the dinner jacket appears to be midnight blue, or even a slightly lighter navy blue. It is one of the few occasions where one of Bond’s many midnight blue dinner jackets looks obviously blue on screen rather than black. Sean Connery wore a suit that resembles this dinner suit to the You Only Live Twice premiere, where it shows up in photos as an even brighter blue. However, the Bonhams listing states that this dinner suit is black, and in their brightly lit photos it does not look blue. Midnight blue is so dark that it is often mistaken for black, but in this case it seems that Bonhams is correct in their description and the suit they sold is black. The auction description states that this jacket is wool, while the suit in the film appears to be a shiny blend of wool and mohair. Mohair could simply have been left off the description of the jacket since it is a type of wool, but the shininess of the suit in the film cannot be detected in the auction listing photos. However, that could be explained as different lighting. The shawl collar on the Bonhams dinner jacket is a different shape from that of the film’s dinner jacket, which tapers more gently down to the button. 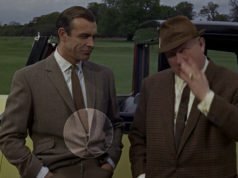 The Anthony Sinclair shawl-collar dinner jackets that appear in Dr. No and From Russia with Love have the same shawl collar shape as the dinner jacket seen in Thunderball, with a wider collar in Dr. No. 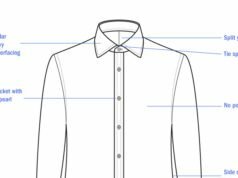 The shawl collar on the Bonhams dinner jacket has a straighter line overall with more fullness (belly) in the lower portion. 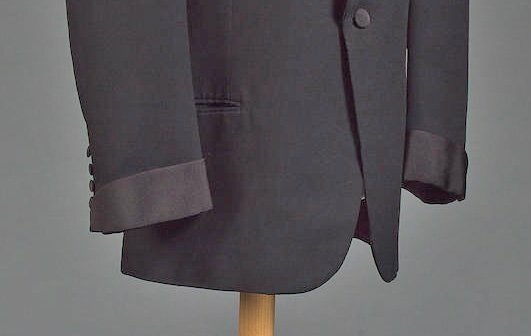 It is possible that this different could be due to pressing, but both the dinner jacket as seen in the the film and the dinner jacket as seen in the photos from Bonhams show a well-pressed lapel with a gentle roll down to the button. 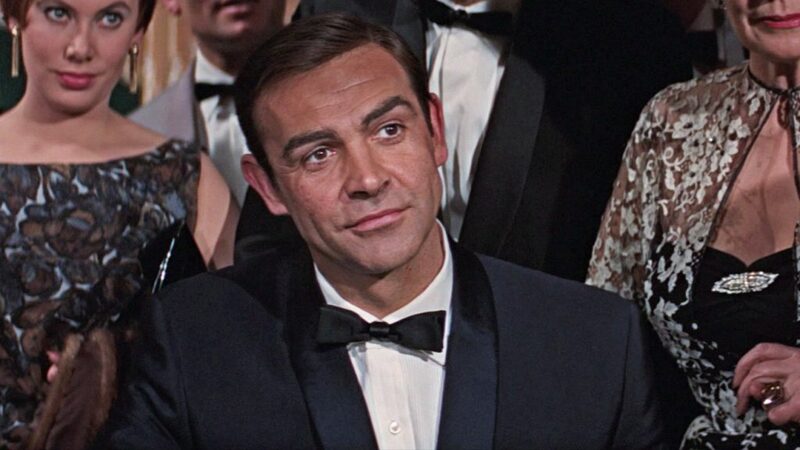 A high-resolution photo of the Thunderball dinner jacket on Sean Connery found on the excellent THUNDERBALLS James Bond Picture Archive (above) reveals that the dinner jacket has Connery’s usual tailor Anthony Sinclair’s signature cut with the extended front dart that can be seen on almost all of Sean Connery’s jackets. Many British tailors in the 1960s cut their suits with the extended front dart. However, when zooming in on Bonhams’ photos, there appears to only be a dart above the hip pockets and it does not continue below the pocket. Also visible in the close-up photo from Bonhams are cuff buttons that are spaced further apart than on the photo of Connery wearing the dinner jacket. The cuff buttonholes on Connery’s dinner jacket mean that the buttons could not have been moved in later alterations, unless all the buttonholes were fake and could be unstitched. Connery held on to a number of his Bond suits after the films. In behind-the-scenes photos from during From Russia with Love, Connery can be seen wearing his light grey suit from Dr. No. He is seen wearing what looks exactly like the dinner suit that he wears in Thunderball at the You Only Live Twice premiere, which means he kept the suit. If he held on to the suit, it would not have likely made its way to be altered for later film productions. 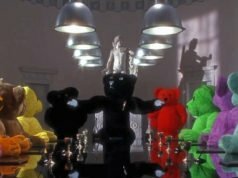 If multiple copies of the dinner suit were made for Thunderball, which is less likely because the suit is not used in action sequences but still a possibility, then Connery keeping the suit doesn’t mean that another couldn’t have been sold at auction. Sean Connery at the You Only Live Twice premiere wearing what looks like the Thunderball dinner suit. 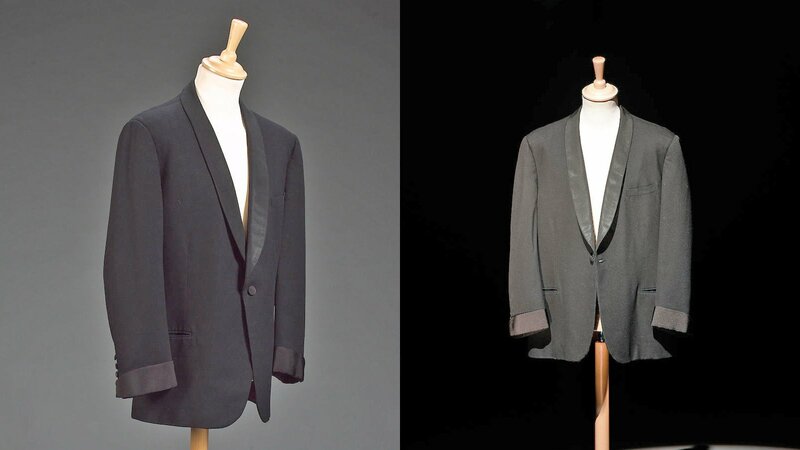 Because the dinner jacket sold at Bonhams has differences from dinner jackets that Connery wears as James Bond, as well as differences from dinner jackets he wears in Marnie or Woman of Straw, what else could it have been made for? Seeing that this suit is from the costumer M Berman Ltd, it would have been made for Connery for a film production and not for his personal wardrobe. 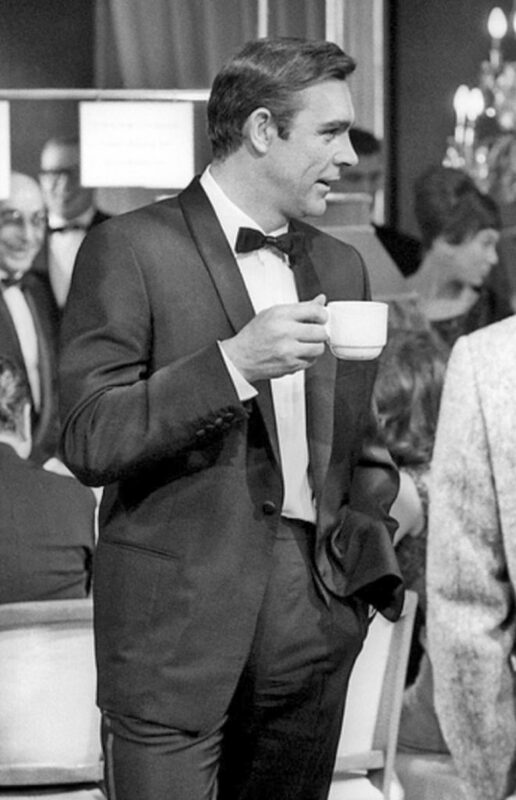 Since the dinner suit is very much in the 1960s style and is from before Berman merged with Nathans in the 1970s, this would have been made for Connery in the 1960s. Could this have been made for another of Connery’s 1960s films? A 1960s television appearance? Or could it have been made for You Only Live Twice and not used? Perhaps the dinner jacket is from Connery’s appearance on the Sammy Davis Jr Variety Show in 1966? Maybe it was used in a scene that later got deleted ? Like Daniel Craig’s cream silk suit in Quantom of Solace ? If were the dinner jacket from the pre-title sequenceof “From Russia with love”? It is explained why it’s not that in the article. Matt, do you think you can cover another Connery suit that was put into auction, the grey herringbone from You only live twice ?